Soft Idli | Breakfast Recipes! Eggless Banana Muffin for a Cause!!! Carrot Halwa Method 2 my 300th Post!!! Karadaiyan Nombu | Adai Recipes! Onion Chutney Method 1 and Review!!! Healing Foods Ginger Garlic Giveaway Winners!!! Healing Foods Ginger Garlic Event Roundup!!!! Pori/Puffed Rice Upma(ಕಳ್ಳೆ ಪುರಿ ಉಪ್ಪಿಟ್ಟು) is very simple and easy tiffin. Its ready in jiffy. This is my mom's recipe. In a kadai, add oil, mustard, wait till it splutters. Add urad dal wait till its brown. Add jeera, onion, curry leaves, green chilli, ginger, turmeric, salt and saute till its transparant. Wash pori in water squeeze extra water and add. Mix well. Saute for few mins. Notes - Grated carrot and grated coconut can also be added. This recipe along with Churmuri is going off to an event HRH- Puffed Rice by Kurinji. Thats a quick and filling upma..
Quick, light and filling upma... My sis makes this..
Yummy upma...light on the tummy too. 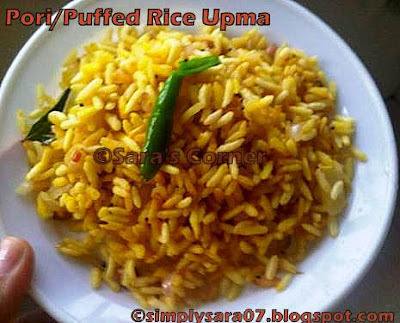 Delicious and yummy upma..love it. So quick and healthy breakfast !! Upma with pori is new to me, thanks for sharing. Also thank u very much for link with my event Sara! A quick, light & a tasty snack! !